If you’re planning to fly to, from or through the Northeast today or tomorrow, you better pack some granola bars (and maybe a sleeping bag) for the airport — even if your flight hasn’t been canceled yet, you’re likely in for some pretty unpleasant delays. 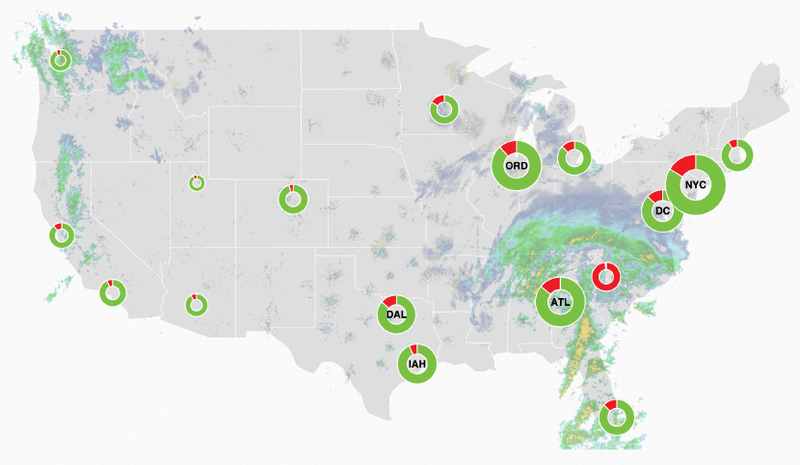 All US-based airlines have now issued travel waivers covering much of the East Coast, from North Carolina to Boston, and according to FlightAware, roughly 2,500 flights have been canceled today and some 2,500 are already canceled for tomorrow. If your flight has been canceled and you haven’t already been rebooked, don’t go to the airport. Call your airline right away (or try to change your flight online) to rebook after the storm — if you can’t get through to a US call center, sign into Skype and try one of your airline’s international lines instead. If you’re already at the airport when your flight is canceled, follow these steps and check out our post in Forbes.